If you’re thinking of visiting Mont Saint Michel in the Normandy region of France, there are some things you should know prior to visiting. This post covers tips for planning your trip to Mont Saint Michel, photos of the area, and a general review of Mont Saint Michel. For starters, a little background is in order. If you’re unfamiliar with it, Mont Saint Michel is an island commune featuring a hierarchical town topped by a beautiful monastery, and sitting inside fortified walls that protect it from high tides. Located 600 meters from “mainland” France, these walls protect Mont Saint Michel from rising tides. The way the character of the area changes based upon the tides is one of the most interesting components of Mont Saint Michel. At low tide, you can walk all the way to the commune, albeit through some nasty mud. 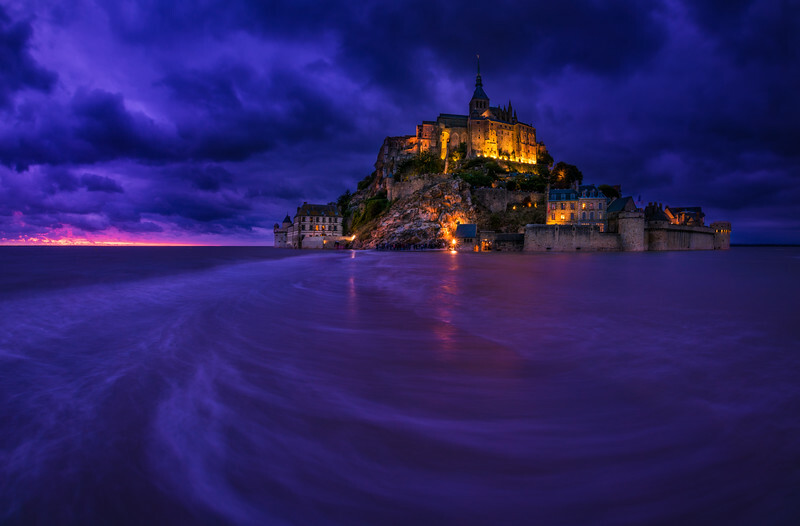 During the highest of tides, Mont Saint Michel is totally surrounded by water. It’s connected to the rest of the Normandy region by a long road with a bridge towards the end (I’m under the impression this bridge was built in the last decade or so). There’s really a lot more to Mont Saint Michel’s rich history (dating back to the 8th century!) and unique character that is well worth reading, but I’m far from an expert on any of this. Beyond what I’ve already written, I’d just be regurgitating information that you can read for yourself on the history section of Mont Saint Michel’s website. Suffice to say, it’s one of France’s most popular tourist destinations outside of Paris, a UNESCO World Heritage Site, and 60 buildings on the island are protected as historical monuments in France. In terms of planning, choosing when to visit is of the utmost importance for Mont Saint Michel. Not in the typical, ‘when to avoid crowds’ sense, either. In fact, you’re going to want to visit Mont Saint Michel at the times it’s busiest. In order to see Mont Saint Michel “become” an island, you have to visit during the highest of high tide, which only occurs a few hours per month. Mont Saint Michel’s official website has a tide chart so you can see when this will occur. What you’re looking for on this calendar is the days highlighted in orange, with a number above 12.85 meters. This means that the access to the island’s road will be cut off briefly as the water rises above it. It might seem like a lot of effort to plan your trip around this tide chart, but in my opinion, it is well worth it. I’ll make the Mont Saint Michel “review” portion of this post short and to the point: watching the tide rise quickly and isolate the commune was one of the best travel experiences I’ve ever had. It took the already-impressive Mont Saint Michel and elevated the experience to the next level. On our recent trip to Europe, we visited many amazing places in France, Switzerland, Austria, and Germany–being at Mont Saint Michel was my favorite stop on the trip. With that said, you should not hesitate to travel to Mont Saint Michel if you absolutely cannot visit during high tide. The community within the walls is quaint and charming, the monastery is elaborate and stunning, and the region around Mont Saint Michel is nothing short of beautiful. Experiencing high tide is merely icing on the cake. Insanely delicious icing, but icing nonetheless. My next planning recommendation would be to rent a car. Mont Saint Michel is accessible by public transit, but in routing it the journey prior to our first visit to France (sans rental car), we determined too much time would be lost in transit. If you don’t plan on renting a car for the duration of your trip, you can always do a 1-2 day rental in Paris and make an excursion to Normandy to see Mont Saint Michel and other spots. Although the drive is mostly through the French countryside, it’s well worth doing. Next, stay at a hotel near Mont Saint Michel, but not on the island. There are a handful of hotels actually on the island, and they are quite pricey. By contrast, there are another handful of hotels situated just a little farther away (walking distance of the island), that cost about half the price. In addition to these hotels being cheaper, they have the additional advantage of offering views of Mont Saint Michel. If you book any of these nearby hotels, make sure to determine whether you’re inside the gated area of the region (this gate prevents vehicles besides buses and visitors who have hotel reservations) or not. If you are inside the gated area, you need to contact your hotel a day or two in advance to get an access code. I’d recommend staying inside the gated area so you can explore the island at night–it gets really quiet after sunset, and is eerily pleasant to wander when no one else is around. It’s easy to walk from the hotels to the island at night, and the walk is quite enjoyable. Alternatively, bus service continues until midnight or 1 a.m. depending upon the season. We stayed at Le Relais Saint Michel, and were satisfied with it. The hotel itself was on the older side and slightly dated (a recurring trend in Europe), but charming and well-maintained. I would recommend, but not to the extent that OMG YOU’VE GOT TO STAY HERE, YOU’LL REGRET STAYING ANYWHERE ELSE!!!1!! You should probably just stay wherever you find the cheapest rate in the area–I’d hazard a guess that most of these hotels are of similar quality. All of the island is free to tour aside from the abbey. We happened to visit on a public holiday (that, coupled with high tide probably made Mont Saint Michel especially busy–even for what was otherwise low season), so there was no admission charge. Normally, you’ll pay 9€, and the experience is well worth that. Speaking of tours, there are a few options for tours once you arrive at Mont Saint Michel. If getting filthy and possibly trapped in mud is your cup of tea, there’s a tour for that. (And in seriousness, don’t venture out into the mud flats without an experienced guide. We saw the mud variant of life guards watching guests who wandered out on their own and were doing their best to get stuck as the tides rose.) There’s a kayaking tour during high tide. There’s probably a hot air balloon tour (there’s always a hot air balloon tour when it comes to France’s top tourist spots). Beyond the mud flats, safety should not be taken lightly during high tide times. The tide comes in really quickly, and areas you think would be safe and well above the high water line could very well become submerged in a matter of minutes. I scouted one spot for photos in a nearby field that I assumed was safe a couple of hours before high tide, only to find that it was submerged by several feet at the peak of high tide. For photography, the popular spot for Mont Saint Michel is Pointe du Grouin du Sud, which is reasonably close as the crow flies, but takes about 45 minutes to access via car from Mont Saint Michel. This would be a good spot for photos when water levels are lower, but given that we were visiting at high tide (and wanted to experience it from the island-area), I figured venturing that way was unnecessary. I stand by that decision. During high tide, there are numerous photography spots that will make for great photos in the area. By traveling to Pointe du Grouin du Sud, you’re basically limiting yourself to one photo, and don’t get the same cool experience of watching the rushing waters of the tide approach. Regardless of where you go to take photos, be mindful of your surroundings and don’t go anywhere that is too far from the main bridge. The adjacent farmland might look appealing, but the water level there rises really quickly. After realizing, I decided to wait until the water level had started receding before venturing out to these spots. Overall, I cannot recommend a visit to Mont Saint Michel highly enough. France is an amazing country with many incredible, historical places to visit, so it can be really difficult to choose how to ration your limited vacation time there (particularly when Paris has more than enough compelling options for a single trip), but I think the Normandy region offers an excellent option for an excursion, and, as mentioned, Mont Saint Michel ranks among my favorite places I’ve ever visited. In future posts, we’ll cover other things we did in Normandy, including the World War II memorials, Étretat, Beuvron-en-Auge, and more. Have you visited Mont Saint Michel? Did you go at high tide? Any tips or thoughts to add? If you haven’t visited, is this a spot that is on your travel bucket list? Questions? Share any thoughts you have in the comments! Thank you for this post and the beautiful photos. I’m planning a trip to to there just to take a few photos of MSM at night and was wondering what type of tripod did you bring? I won’t be traveling with a lot of luggage, just a backpack as my camera bag and a small carry on. I want something light so I can do a long exposure shot like the one you did at the top. Also, can you walk up to the island after even if you don’t stay on the island after midnight from the hotel? Did you find it particularly difficult to drive to this hotel? You’ve convinced me to rent a car from Paris to get here. What should I prepare for? I’ll take the liberty of replying since we did the same drive this summer. A GPS (either in-car or via your phone) is a great help when driving someplace unfamiliar, but Mont’s St. Michel is an easy drive from Paris and all the hotels Tom references are right off the main road leading to the island. As for things to be prepared for – I would list tolls. We came from Versaille and then drove west and cut up through Falaise (birthplace of William the Conqueror – worth a stop). If you go the fastest route from Paris you will be on toll roads part of the way. Our experience was that some of the toll rods in France are quite expensive and do not take American credit cards at the toll booths. So make sure to have enough Euros on hand. Thank you Kevin. It sounds manageable enough and a little less daunting. Thank you for gorgeous photos and very helpful information – truly a magnificent place. Wonderful installment. The first photo is really a treasure. I’m feeling they could sell this in their “gift shop” for a pretty hefty price. You should shoot them an email. Do they have a shop here? There are several shops on the island, all run by third parties. I’m not sure these photos are their style. They mostly looked like heavily ‘faked’ photos from the early 90s. Milky Way superimposed behind MSM, moon 100x the size it should be, etc. Did you have any trouble with your tripod moving as the water rose? Yeah, I always kept my hands floating around the camera, as the water tried to knock it over on several occasions. Mont St. Michel is one of my all time favorite places I’ve ever been! I’ve heard so many people say that it was too touristy or too crowded – but we went in mid-January and had fantastic weather. I enjoyed the drive there – and in fact, I find most of Normandy to be beautiful. No problems with the tide or the police for that matter – just an wonderful visit all around. And of course, I love your photos – as always. Was it cold at all during your visit? I’ve been to France in December, and while not unbearable, it was most definitely winter coat weather. Not sure I’d want to be in the water then. I thought I’d also mention that they told us that the buses to the parking lot ran 24 hrs, you just had to call if it was after 1am and they would come get you. We stayed at a B&B about 15 minutes away. We had to pay a small fee to park but not having the view was a small loss since we slept as soon as we got back. Totally forgot about that, we were told the same by our hotel–the shuttles do run 24 hours! I don’t think the view was even remotely important at our hotel (although it was cool); it was more about convenience. I walked from the hotel to MSM on several occasions, and liked not having to rely on the shuttle early in the morning and late at night. Of course, if you’re not staying out super late for photos and get up at the crack of dawn (or just take the shuttle) maybe this doesn’t matter. What’d you think of the B&B? The B&B worked great for us. There were several caravans for rent, but we went with something more permanent. We had just stayed at the Park Hyatt Paris, so the comparison was abrupt. But for a night were we got back at midnight and drove off as soon as we got up in the morning, it more than met our needs. And the Welsh couple that ran the B&B was very nice. I’ve been waiting for this post! So jealous! Glad you had a great time and that you were able to come back with some fantastic shots! Yeah! I’ve been waiting for you to post your photos and they did not disappoint. I love the sunset shot of the island – were you standing on the actual bridge when you took it? It seems like you were at least close from the angle. The bridge never went all the way under the water when we were there (12.15m high tide, if I recall) but it was still awesome to see. Ha, that thing was definitely not out. Must be exclusive to the night tour. Looks neat, I guess? I was standing just off the bridge (towards MSM) when the photo was taken. The bridge itself was only submerged near the point where it meets the pavement, but the pavement between the bridge and MSM was totally submerged; probably by 1m or so.